I have a confession to make. I have been photographing climate change for four years, and continue to do so, not only to make others care and understand but to try and wrap my head around this larger than life global crisis myself. In some ways I have grown to understand it better; on an intellectual level (as much as a non-science minded person can), and on an emotional level out of a sense of duty, love and respect for animals and the environment- and most of all- empathy for the people whose lives are already being challenged and transformed. However, I had never really felt, in my bones, the weight of it all. I had never felt a sense of real fear, for myself, for those I love most, and for all of humanity. But that was what rushed over me when I finished working in Siberia, my biggest shoot yet for a long-term assignment I am doing with writer Craig Welch for National Geographic. We weren't planning to publish anything any time soon, but it was too important, groundbreaking and scary to wait to share this one aspect of the larger story in Siberia. For the first time ever, in some of the coldest places in the world, the ground that insulates permafrost did not freeze. 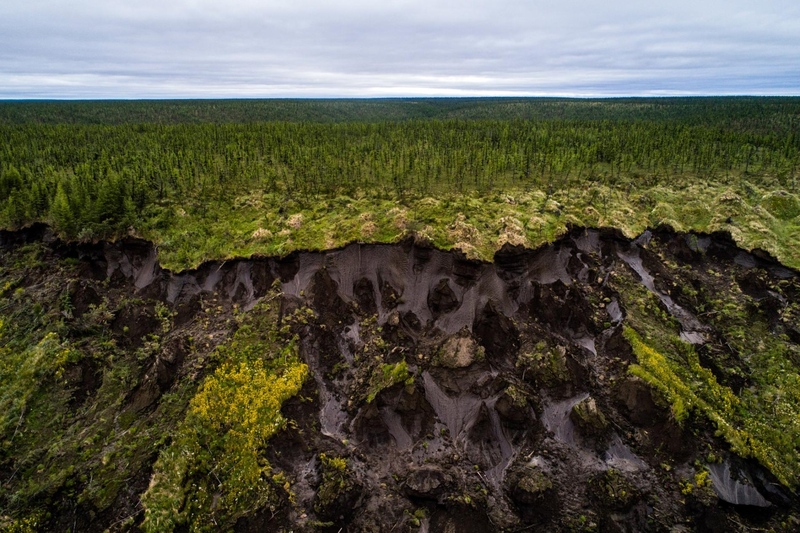 Permafrost is a layer of continuously frozen earth that not only helps maintain the Arctic ecosystem but holds an enormous amount of greenhouse gases including methane, which is 25 times more potent than Carbon Dioxide. When permafrost thaws, which scientists believed would inevitably happen in hundreds of years, these gases will be released into the atmosphere. Everything will change, but now, it might be happening much sooner than we thought. And for me, something already has changed. Standing inside the Batagaika Crater on my last shooting day, watching and listening to the earth as it tumbled down towards me, has affected me in ways I have a difficult time articulating. I wish I could just take everyone there, especially those in political power, to experience it first-hand. But I am grateful that at the very least, I can share my photos. New data from two Arctic sites suggest some surface layers are no longer freezing. If that continues, greenhouse gases from permafrost could accelerate climate change. By Katie Orlinsky — Katie Orlinsky was a featured guest on 24 Hours of Reality, a global effort to focus debate on solutions to the climate crisis. It is a..
By Katie Orlinsky — This week we're talking to New York City based photojournalist and documentary photographer Katie Orlinsky. View here . By Katie Orlinsky — Help get Obama and congress to pass the legislation we need to keep millions of acres of wilderness in Alaska safe from oil and gas development by..
By Katie Orlinsky — New work on climage change in Alaskan arctic villages after the spring thaw:..
By Katie Orlinsky — Honored to be selected by The International Women’s Media Foundation (IWMF) as part of the first group of 2015 grantees in the inaugural..
By Katie Orlinsky — The Inspiring Sled Dogs and Stunning Views at Iditarod by Jakob Schiller Katie Orlinsky is willing to suffer to make her photos. For the past month..
By Katie Orlinsky — Photos from the early days of this Iditarod in the New York Times today. View here . By Katie Orlinsky — A few weeks ago, I photographed the toughest sled dog race in the world, the Yukon Quest , for National Geographic News. It was a..